Since no functional electronic nose existed in our laboratory, data was utilized from the Jet Propulsion Laboratory (JPL) research group's e-nose for initial tests., Cluster simulations were also created using data extrapolated from graphs of mean resistance data from the JPL group paper, "Nonlinear Least-Squares Based Method for Identifying and Quantifying Single and Mixed Contaminants in Air with an Electronic Nose" (Zhou et al. 2006; Table 1). Table 1. Chemical Database. The database provides the chemical name, a simplified linearized structure, and the molar mass of each of the ten chemicals shown. Cluster simulations were created using data extrapolated from graphs of mean resistance data from the Jet Propulsion Laboratory electronic nose paper, "Nonlinear Least-Squares Based Method for Identifying and Quantifying Single and Mixed Contaminants in Air with an Electronic Nose" (Zhou et al. 2006). The chemical structures are represented in Simplified Molecular Input Line Entry Specification format (SMILES). A small external chemical database was also created with information such as the chemical name, molecular weight, and a simple linearized representation of its structure. The algorithm utilizes two-stages to extrapolate a chemical identity from the resistance data and external database provided: a training phase and an operational phase (Figure 1). Figure 1. Schematic of Program Phases. In the training phase, all chemicals are analyzed before PCA is performed. The operational phase then uses the PCA scaling matrix, the original clusters, and an external database to perform a structural comparison to infer the chemical identity of an unknown. The chemical clusters used in this trial were simulated with data extrapolated from graphs (Zhou et al. 2006). In the training stage, the algorithm undergoes supervised learning. It accepts an array of sensor data from the electronic nose along with the name of the compound. Once the training set of data points of various chemicals is input into the program, the program performs PCA analysis to scale data down from the initial number of dimensions, which typically ranges from eight to thirty-two, to a user-input dimension, typically three. The PCA analysis returns a transformation matrix through which other incoming matrices in the operational phase can be scaled to the same space. It also returns a new matrix of PCA-scaled values of the training data, which is used to create a data cluster for each chemical (Figure 2). Figure 2. Graph of Training Phase Output. Each of the chemicals is scaled through PCA to three dimensions from thirty-two. The centroid, variance, and number of points are determined and saved in the cluster. The initial points are discarded to save memory. The chemical clusters used in this trial were simulated with data extrapolated from graphs (Zhou et al. 2006). Each cluster contains data such as the chemical's name, the centroid of the cluster, its variance, the number of points it holds, and the chemical structure, which is determined from the external database. Once the program is trained to an initial set of chemicals, the operational phase begins. In the operational phase, unknown chemical sensor data is input into the system in the same fashion as the training data. PCA scaling and rotation transformations are then applied to the new matrix of data so that it occupies the same space as the training phase-created clusters. This data is represented as a PointCluster, which stores its initial points, unlike the clusters representing identified chemicals (Figure 3). Figure 3. Graph of PointCluster in relation to Known Clusters. Each of the known clusters is represented by its name and centroid. The unknown PointCluster, in actuality Ethanol, is represented by the green dots. PointClusters retain their data points for centroid and variance calculations for analysis later in the process. The chemical clusters used in this trial were simulated with data extrapolated from graphs (Zhou et al. 2006). Using the cluster form, the unknown can then be represented spatially by its centroid. The unknown chemical is then mapped alongside the known clusters. The clusters with the highest probability of containing the centroid are then found. This probability calculation is done using Chebyshev's inequality, which states that the probability from the distance is less than or equal to the variance over the square of the distance (Equation 1). Each cluster is assigned a "confidence" that the unknown chemical appears in that cluster equal to the variance over the square of the distance between them. The k-number of compounds with the highest confidence factors are then returned to the main program for feature processing. Next, the molar mass of the compound and its deduced structure are used as factors to locate similar compounds. The database is searched to find the compound with the largest sum of confidence factors from the substring. This compound confidence is also weighted by comparing the mean of the nearest neighbors' molar masses to the molar mass of the compound. The compound with the highest calculated confidence is considered to be the identification match for the unknown chemical. This result is returned to the main program, which then "learns" the compound according to the nature of the identification. If the identification match has already been made into a cluster, the points from the new cluster will be added to it and the centroid and variance will be recalculated. If the unknown has been identified as a new chemical, a new cluster will be created to represent it (Figure 4). Figure 4. Representation of Newly Recognized Clusters. The algorithm has correctly identified the unknown cluster as Ethanol. 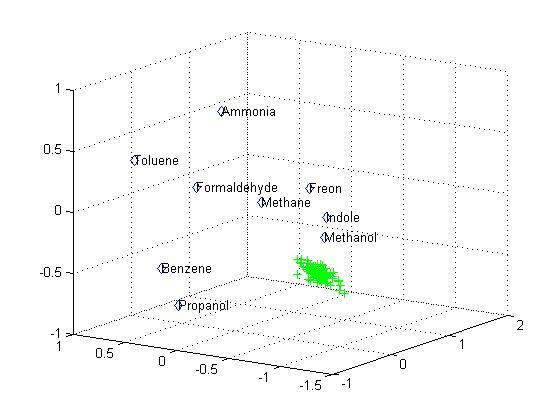 It now creates a cluster to represent Ethanol, discards the points, and continues analysis. The chemical clusters used in this trial were simulated with data extrapolated from graphs (Zhou et al. 2006). The program reports these changes, and is then ready to accept a new operational data set. Table 2. Trial with Ten-Member Training Set. In this trial, all chemicals were entered in the training set. Then a smaller cluster with an almost identical centroid to one of the existing chemicals was input in the operational phase. The algorithm correctly determined the identity of each chemical, leading to an accuracy of 100% in this case. The simulated chemical clusters were extrapolated from "Nonlinear Least-Squares Based Method for Identifying and Quantifying Single and Mixed Contaminants in Air with an Electronic Nose" (Zhou et al. 2006). Table 3. Trial with Nine-Member Training Set. In this trial, nine of the ten chemicals were entered in the training set. The tenth chemical was then presented in the operational stage. The algorithm was supposed to extrapolate the identity of the unknown from the similar molecular substructures of surrounding chemicals. However, possibly due to the limited training set, the test resulted in 20% accuracy. The simulated chemical clusters were extrapolated from "Nonlinear Least-Squares Based Method for Identifying and Quantifying Single and Mixed Contaminants in Air with an Electronic Nose" (Zhou et al. 2006).